From a worldwide, high-tech businesses to a store owner whose family has more than 100 years of history in the city, they all have one thing in common. They Choose Hampton. "The heritage of the city was founded on the seafood industry...We're part of it, we are Hampton." Graham & Rollins Inc. has chosen Hampton for 75 years. The fourth generation owned and operated company thrives on the picturesque waterfront location and owner Johnny Graham says his family will continue to choose Hampton. Watch the video here. Community history. A vibrant boating community. Great waterway access. These are some of the reasons the owners of Signature CanvasMakers chose Hampton. Community history. A vibrant boating community. Great waterway access. These are some of the reasons the Chandler and Charlene Clark, owners of Signature CanvasMakers, chose Hampton for their business. Watch the video here. "We are proud to be a part of this community and are here to stay." Talk to the folks at Atlantic Railing and they'll proudly say they happy to be in Hampton - and that they're here to stay. Find out more about Atlantic Railing and why they choose Hampton. Watch the video here. "I chose Hampton because it's a family-oriented city." Kingsway Physical Therapy improves people's quality of life in Hampton through their commitment to clinical excellence, customer service, physical therapy education, and clinical research. See why Shola Asenuga chose Hampton for her practice. Watch the video here. "Tribal Yoga Studio brings healing and health to the community"
Aerospace Engineer Amber Favaregh enjoys the convenience of living and working in Hampton. And as the owner of Tribal Yoga she is proud of the people who make her Hampton studio a part of their life. Watch the video here. "Our Hampton investments are a resounding success because of the city's connectivity and support." Landmark Hotel Group is a hospitality management company, which owns, operates and develops hotels along the East Coast. The company is founded on the knowledge and understanding that excellent service and a quality product is key to achieving the highest level of performance. Watch the video here. "Hampton is a great place to do business because it offers so much to its residents - miles of waterfront, shopping, eating, and events." For more than 75 years, the name Drucker has been an integral part of the real estate industry in Hampton Roads. Wendy Drucker, granddaughter of the company's co-founder, says Hampton is a great gateway community with a beautiful waterfront, good shopping and good entertainment. Learn more about why Drucker & Falk chooses to do business in Hampton. Watch the video here. Virginia Tech chose Hampton because it is crabtown. The Virginia Tech Virginia Seafood Agricultural Research and Extension Center located in downtown Hampton provides education, scientific and technical guidance, support and leadership to the commercial seafood and aquaculture industries throughout Virginia and the United States.Watch the video here. Beauty for Ashes Contemporary School of Dance is a performing arts organization that includes a repertory dance theater company. As an independent non-profit organization the mission of BFACSD is twofold: to educate and create in the realm of contemporary dance by building bridges of understanding through the presentation, instruction and celebration of choreographic works, focusing on under-served communities while also addressing the broader public. Watch the video here. From the roller derby inspired “Rolling of the Bulls” to the Hampton “Manditarod,” the owners of Venture Kitchen and Bar downtown like being “a little odd.” Watch the video and learn how they choose Hampton for an exciting mix of restaurant marketing and civic engagement. Watch the video here. "We choose to enhance youth development in the City of Hampton." Alternatives annually impacts approximately 4,000 children and young people on the Virginia Peninsula. Rather than a center based program, Alternatives embeds high quality programs into child care centers and after school programs and neighborhoods. Watch the video here. "Mooyah chooses Hampton as a strategic location to grow our brand in Virginia"
MOOYAH Burgers, Fries & Shakes, one of the hottest and fastest growing "better burger" franchises chose Hampton's perfect location to serve up it's burgers, fries and delicious shakes. Watch the video here. "The Center for Digital Government chose Hampton as a technology leader and we couldn't be more honored." Hampton has been ranked among the survey’s top 10 for 13 out of the past 14 years! This distinction allows Hampton to be known for using technology in operating efficiency, innovative and creative solutions, collaboration, and transparency among our citizens. Watch the video here. "We chose Hampton for the opportunity to grow, be closer to our customers and be closer to the water." In business since 1977, Appomattox River Company has been a leader in paddle sports and one of the largest canoe and kayak specialty stores around. From kayak fishing, to whitewater kayaking, to canoeing, to stand-up paddle boarding, Appomattox River Company has someone who can help you find the right paddle craft for your next adventure. Watch the video here. 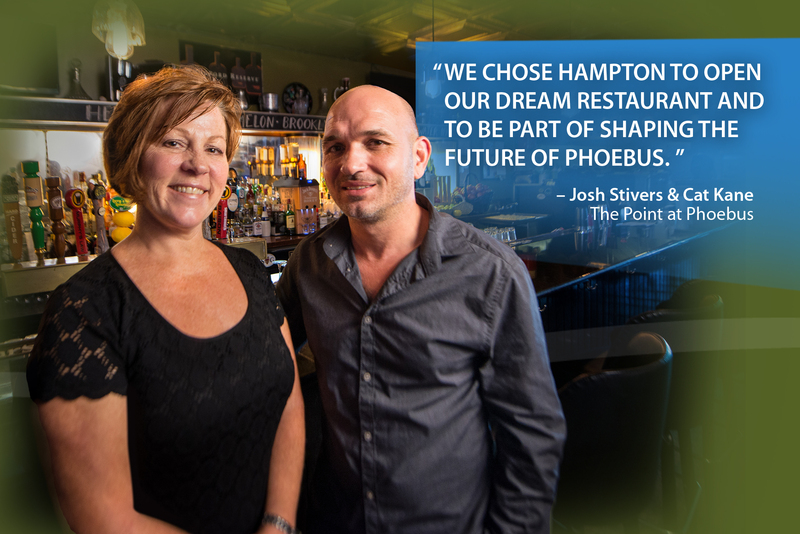 The Point at Phoebus brings a farm to table sustainable approach to dining and agriculture. Sourcing most of their foods from local farms and producers, their menu is prepared from scratch in house to ensure the best quality, flavor and freshness. Stop by the Point to enjoy delicious food paired with a great selection of craft beers, spirits and signature cocktails. Watch the video here. "We’ve seen great success in Hampton because of its vibrant location and strong workforce." Founded in the early 1960s, Chick-fil-A has steadily grown to become the largest quick-service chicken restaurant chain in the United States. Chick-fil-A has set itself apart by pioneering innovations and delicious products — including the ever-popular Chick-fil-A Chicken Sandwich. See how they have grown in Hampton since 2008 by leveraging an excellent location and great workforce. Watch the video here. "Hampton is a hub for technology and it makes good business sense for us to be where the action is." The Technology Commercialization Center (TeCC) comprises a consortium of technology and business experts who help inventors take their products from the lab to the marketplace; and helps established companies with their business needs. The commercialization of technologies results in new products and enhancement of existing products. Watch the video here. "Sentara CarePlex Hospital chooses to serve Hampton with state-of-the-art healthcare and exceptional service." Sentara CarePlex Hospital is a technologically advanced, acute care hospital, and Certified Primary Stroke Center located in Hampton, Va. The 224-bed hospital offers an eICU to monitor patients even more closely with state-of-the-art equipment and computer software. Sentara CarePlex Hospital provides care through advanced surgical programs, emergency cardiac intervention and fellowship-trained physicians. It is also home to an Orthopedic Hospital. Watch the video here. "We choose Hampton because it’s got that nice hometown effect." A lighting store in the Phoebus section of Hampton, Cody's Lighting and Repair serves all your lighting needs including parts, restoration and repairs. Their vintage lighting is professionally restored to “like-new” condition and with over 3,600 table lamps, chandeliers, floor lamps and vintage lighting on display. They are the largest and most varied source of old time lamps, lighting parts and fixtures regionally. The Phoebus area reminds Mr. Henson of growing up in Missouri and is now proud to call Hampton, VA home. Watch the video here. "We choose Hampton's educated, multilingual workforce to serve our clients in 162 countries"
Registrar Corp was founded in 2003 to assist businesses with compliance with U.S. Food and Drug Administration (U.S. FDA) regulations. Since opening its headquarters in Hampton, Registrar Corp has expanded to seventeen international offices and has aided more than 20,000 companies across 162 countries. Employees include former U.S. FDA officials, scientists, and industry experts. Watch the video here. "St. George Brewing Company chooses Hampton for one of its key ingredients, water." The folks at The St. George Brewing Company - named for England’s patron saint of chivalry - have been inspired to produce several award-winning ales and lagers. The owners chose to locate the brewery in Hampton because of our “awesome” water. Watch the video here. "The supportive business community and central location make downtown Hampton the perfect choice for Fulton Design"
Fulton Design is a one-stop provider of graphic design, advertising and branding services in Hampton, Virginia. Located downtown, owner Bob McCracken has built a network with other small businesses that help each other thrive by sharing their ideas. Fulton Design is committed to the highest level of service and quality in everything he does. Watch the video here. "Great shopping. Great dining. And a great experience for race fans. That's why Langley Speedway chooses Hampton." From its modest opening in 1950 as a dirt track with few amenities to today’s paved showplace, Langley Speedway has consistently stayed ahead of the competitive and administrative curve. Today it holds the reputation as one of NASCAR’s best weekly tracks. Watch the video here. "People choose to live downtown for its great location." These unique downtown Hampton apartments are bringing new life to historic Downtown Hampton. Fine dining, shopping, art galleries, festivals, museums and other attractions within steps of your doorstep are just a few reasons to Choose Hampton. Watch the video here. "Paradise Ocean Club chose a unique and historic property." Music, food, sun and sand. The Paradise Ocean Club at Fort Monroe has it all. But owner Baxter Simmons says he chose the location because of the unique and historic nature of the beachfront property. Featuring everything from fresh seafood to steaks and wraps, the club has become a “go to” destination in Hampton. Watch the video here. 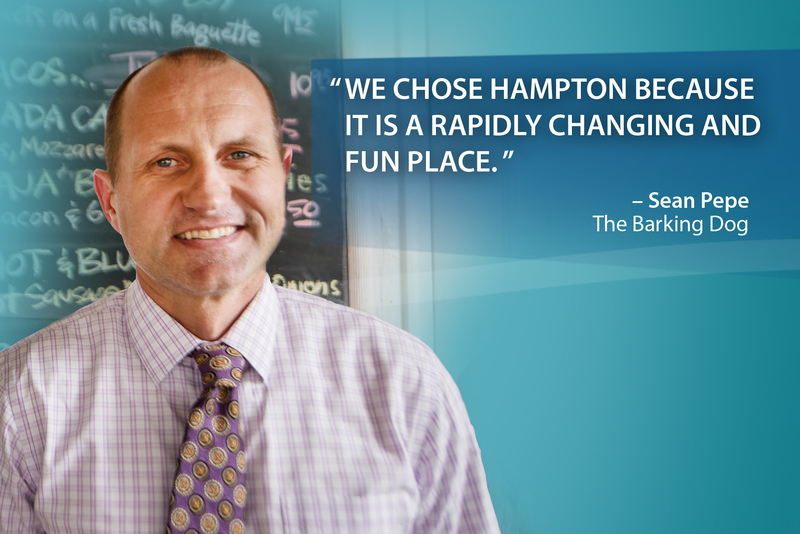 "We chose Hampton because it is a rapidly changing and fun place." Joint. With outdoor seating directly on the water it's no wonder why people flock to this local restaurant in search of great food and good conversation. Co-owners Sean Pepe and Gary McIntyre, with the help of social media and word of mouth, have made the Barking Dog succeed in bringing an entire community together. Watch the video here. 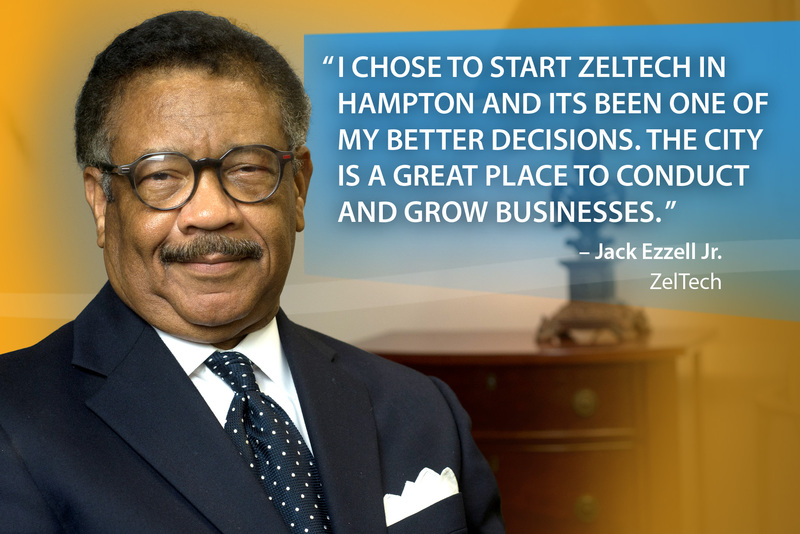 more than 20 locations worldwide, ZelTech chooses to make Hampton home. Watch the video here. 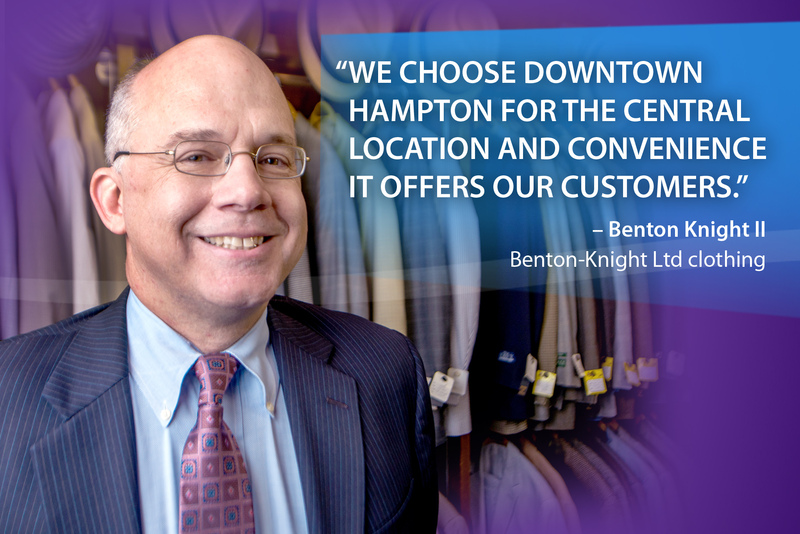 "We choose Downtown Hampton for the central location and convenience it offers our customers"
downtown businesses and attractions as well. Watch the video here. "Crossfit Stimulus chooses Hampton for its success and growth opportunities." Crossfit Stimulus got its start just a few years ago in a one-car garage. Today, it’s the largest Crossfit gym in Hampton Roads, in a new, 15,000 square-foot facility that welcomes men and women of all ages and walks of life. Crossfit chose to stay in Hampton because of the many opportunities in the city for success and growth. Watch the video here. "We choose to locate our corporate headquarters in downtown Hampton and couldn’t be more proud." 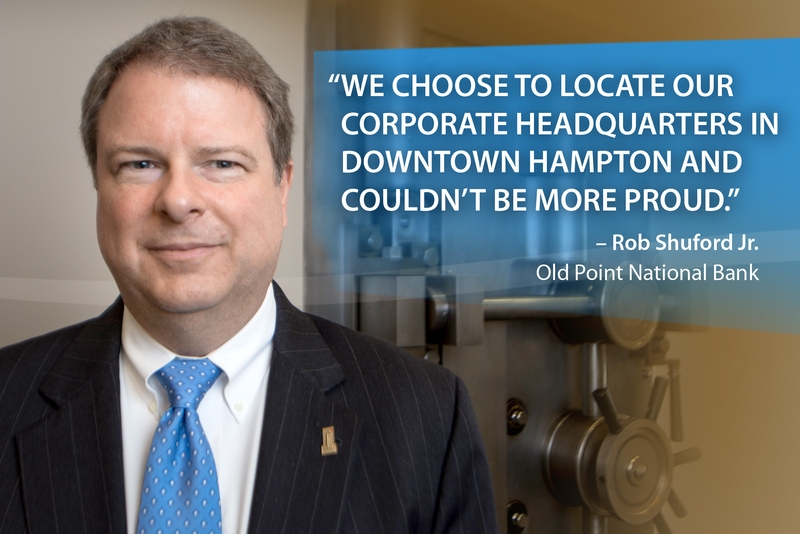 Old Point National Bank has been committed to Hampton since 1923, when it first opened at the corner of Mellen and Mallory streets. Today, the bank named after the Old Point Comfort Lighthouse has 18 branches across the region, but it still chooses to proudly call Hampton home. Watch the video. 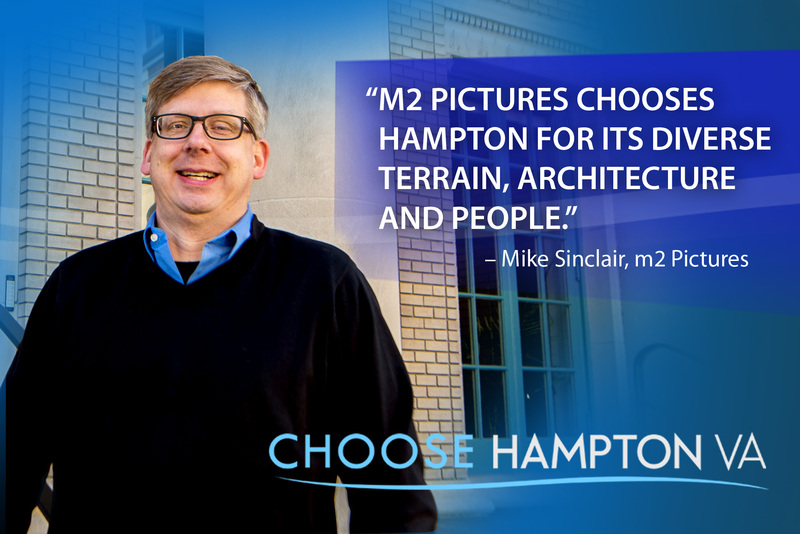 "m2 Pictures chooses Hampton for its diverse terrain, architecture and people." ratings-grabbing television and unscripted programming. The company has produced hundreds of hours of programming for Animal Planet, National Geographic and many others. M2 chooses to make downtown Hampton home for its headquarters, production support and studios.Watch the video. "We choose Hampton because of our longstanding relationship with the City"
Founded in the 1920s by a "butcher who became an auto magnate," the Tysinger auto dealership was a fixture in downtown Hampton until 1988, when it was moved to Magruder Boulevard in Hampton. The company remains a city booster and chooses to stay in Hampton because of it's long-standing relationship with the city. Watch the video. "The dedicated and highly skilled workforce make Hampton the perfect choice for Alcoa Howmet." Alcoa Howmet is a world leader in the casting of superalloys for jet engines and airframes as well as industrial gas turbine engine components. With 27 manufacturing facilities worldwide, the company chooses to stay in Hampton because of the dedicated and skilled workforce, access to secondary education for employees, and convenient location. Watch the video. "We are a major service provider but also a major business and employer . . . and we choose Hampton as our headquarters." The staff at Versability Resources - formerly known as the ARC of the Virginia Peninsula – is committed to creating new opportunities that highlight the abilities of people with disabilities. A major business and employer in Hampton Roads, Versability was started in Hampton 60 years ago. Today, it continues to “Choose Hampton” as home while also serving individuals in Newport News, Poquoson, York and 10 other counties on the Middle Peninsula and Northern Neck. Watch the video. 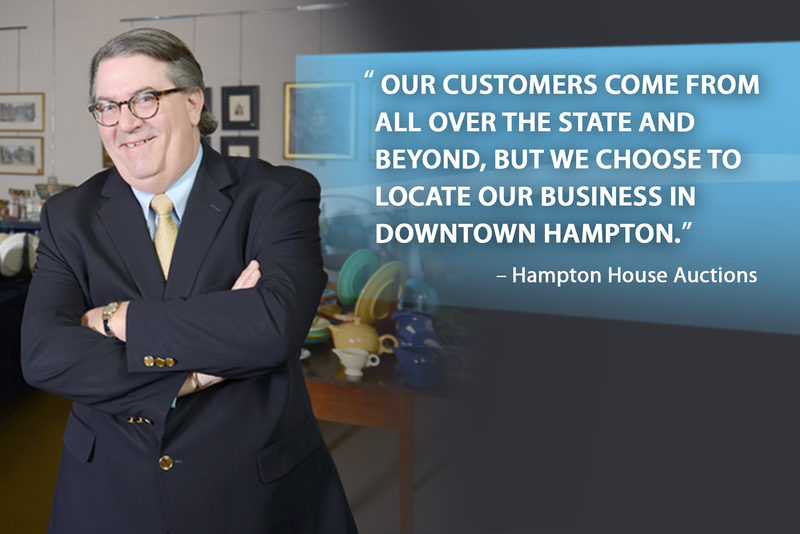 "Our customers come from all over the state and beyond, but we choose to locate our business in downtown Hampton." Controlled sales, negotiated sales, auctions, appraisals and evaluations are just some of the services offered by Hampton House Auctions and owner G. Amory LeCuyer. There is detailed explanation of the company’s philosophy on the Hampton House home page,www.hamptonhouseauctions.com. It ends by saying: “Even if we are not the solution we probably know who is.” Hampton House Auctions chooses downtown Hampton as its home.Watch the video. "We choose Hampton because it is the cradle of aerospace history and remains at the forefront of aerospace technology." A non-profit research and education facility located in Hampton Roads Center, the National Institute of Aerospace conducts leading edge aerospace and atmospheric research. Formed by a consortium of leading research universities, including Hampton University, the University of Virginia and Virginia Tech, the Institute is thriving here in what Institute President Douglas Stanley calls the “cradle of the aerospace industry.” Watch the video. "We spread it, mix it, shake it, stir it everywhere, but we call Hampton our home." After stepping into the national spotlight with a September appearance on ABCs “Shark Tank,” the three Hampton women behind 'Mango Mango’ Mango Preserves – an offshoot of the catering business they started in 2007 - saw orders skyrocket. Today, their preserves can be found in local stores, online and in Whole Foods groceries. Lakesha Brown-Renfro, Nzinga Teule-Hekima and Tanecia Willis opened a new office and packaging space in January of 2014, with plans to roll out several new products in coming months. And they choose to do business in downtown Hampton. Watch the video. "We've chosen Hampton for over 100 Years." Patrick’s Hardware first opened its doors as a general store on Queen Street in 1895. Today, at that same location, it’s a third-generation hardware, glass and paint store serving customers from Richmond to Norfolk. Watch the video. "We are one of the top 100 fastest growing companies in the U.S. with a global impact and we choose Hampton as home." Measurement Specialties, a global designer and manufacturer of sensors and sensor-based systems, has over 3,300 employees operating in 20 sites throughout Europe, Asia and North America, and they chose Hampton, Virginia for their corporate headquarters.